Conflict in the workplace is inevitable. When you have the right words and phrases at your command, you can quickly resolve any disagreement—and prevent it from spreading into an uncontrollable fire. Lawrence Polsky and Antoine Gerschel are managing partners at PeopleNRG, a consultancy firm in Princeton, NJ, that leads teams through change. 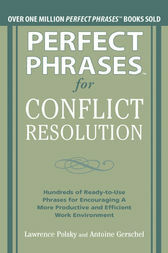 They are the authors of Perfect Phrases for Communicating Change.